Tuesday, August 03, 2010: Derry, New Hampshire — HomeAdditionPlus.com announced today its Wood Flooring Installation Bid Sheet. 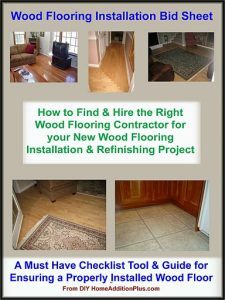 The Wood Flooring Installation Bid Sheet is a comprehensive checklist tool and guide for assisting homeowners in obtaining quality wood flooring installation quotes and hiring an experienced and professional wood flooring installation contractor. The Wood Flooring Installation Checklist / Bid Sheet is comprised of three main elements. The first element is a detailed set of checklist questions compiled in a “Request for Quote” format that homeowners provide to prospective wood flooring installation contractors for bidding on their wood flooring project. The 21 page, Wood Flooring Bid Sheet’s checklist contains over 100 questions on all aspects of wood flooring installation and refinishing. The second element of the bid sheet is a homeowner’s guide on wood floor installation and refinishing to enable homeowners to quickly understand prospective wood flooring contractor responses to the checklist section. Specific topics addressed in the homeowner’s guide section include a discussion on types of wood flooring products, wood flooring installation methods, measuring for flooring, subfloor preparation, wood floor installation, and wood floor finishing. In addition, the homeowner’s guide section of the bid sheet also discusses estimated costs for various wood floor types and installation methods, time intervals for completing work, workman’s compensation and liability insurance coverage, debris disposal, and reference checks. The final element of the Wood Flooring Installation Bid Sheet provides tips to homeowners on how to search out and find prospective wood flooring professionals to bid on the project, and how to work with them in order to ensure their wood floor is installed to their complete satisfaction. Priced at only $15 the Wood Flooring Installation Bid Sheet offers great value. It can save homeowners thousands of dollars on poorly installed wood floors, and avoid major hassles and disappointment. The Wood Flooring Bid Sheet is immediately downloadable and can be purchased online at HomeAdditionPlus. About DIY HomeAdditionPlus.com: Home Addition Plus provides extensive DIY home improvement and planning products for home additions and other home remodeling projects, including a suite of contractor bid sheets. Visit us online: HomeAdditionPlus.com.